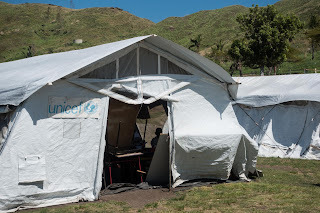 hit by Cyclone Winston and its school is still housed in UNICEF tents. 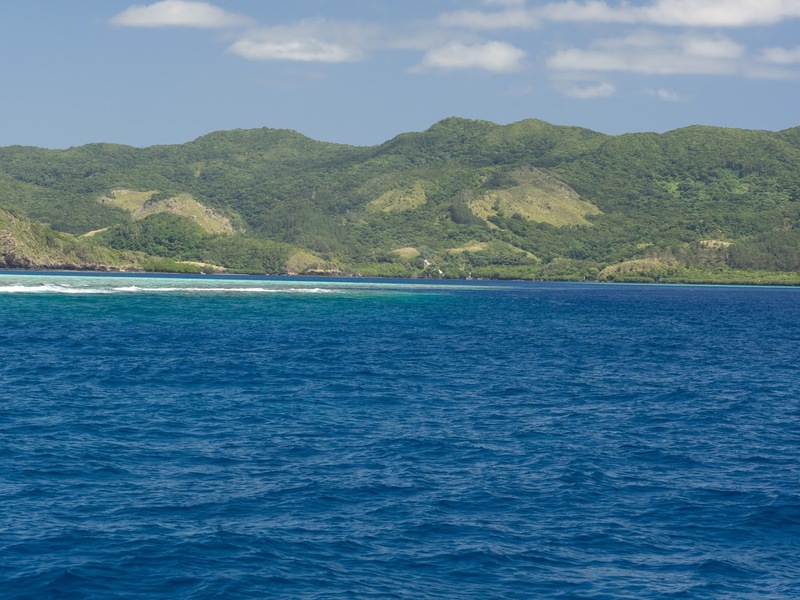 But its proximity to the 'mainland' (actually the second-largest island, Vanua Levu) means it has a pipeline with fresh water and will soon have mains electricity. Dravuni, 40 miles south of the biggest island, Viti Levu, has neither, so islanders draw their water from a well and have to put up with the noise and expense of a generator. However, as my friend Lynne says, you can make your own luck, and that's what the villagers on Dravuni have done. month is enough, they say, so between cruise ships they dismantle the pier and locals use it as a fishing platform out in the bay. wonder whether that's just because they aren't able to buy them, or whether it's linked to their distrust of people hiding their features; when we very first arrived in Fiji, in Vanua Balavu, we were told that dress code was cover your knees, but don't wear a hat or sunglasses when talking to Fijians (and don't carry a backpack - hold bags where they are visible - that's for men, as women are not supposed to carry bags at all!) Living next to expanses of water, in bright sunshine, islanders have sore eyes because of the glare; their houses are also poorly lit. We were able to do something about this last problem as we have a supply of Sea Mercy solar lights: very clever small solar cells attached to a sturdy balloon with hanging points, which when inflated gives off an impressive amount of light. Apart from some old copies of the Fiji Times, the only reading material is the Bible and its tiny print is better deciphered in decent light with reading glasses. 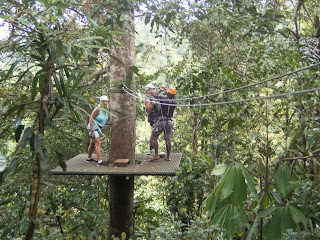 course (in the end, she found another lift, so that didn't happen). Church on Sunday, we were told, was at ten, so we duly dinghied ashore just before ten the next day, to find that Fiji Time applied and we were much too early. A hollow tree trunk, 'lali', was beaten at 10 ('start thinking about going to church'), again at 10.15 ('time to start ambling churchwards'), 10.30 ('time to arrive outside the church'). The service began about 10.40 and was entirely in Fijian apart from a welcome and thank you to us in English. The sermon was almost an hour long. A helpful lady in the pew behind us told it was about the miracle of the loaves and fishes. Apart from a few naughty children and the Manbys, shifting uncomfortably on the hard pews, the congregation listened intently and sang beautifully, with added harmonies, when it came to the hymns. 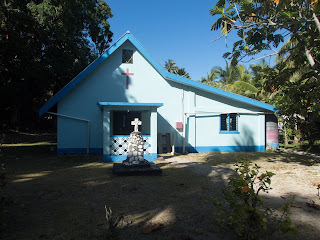 All churches in this part of Fiji are Methodist, we were told. the islands. We went ashore at the Royal Suva Yacht Club (of which we are now members) and enjoyed two nights at the Grand Pacific Hotel, built in the 1920s to accommodate passengers from liners; it fell into disrepair in the 80s and has only recently been refurbished. Lovely 25m pool and superb breakfasts. 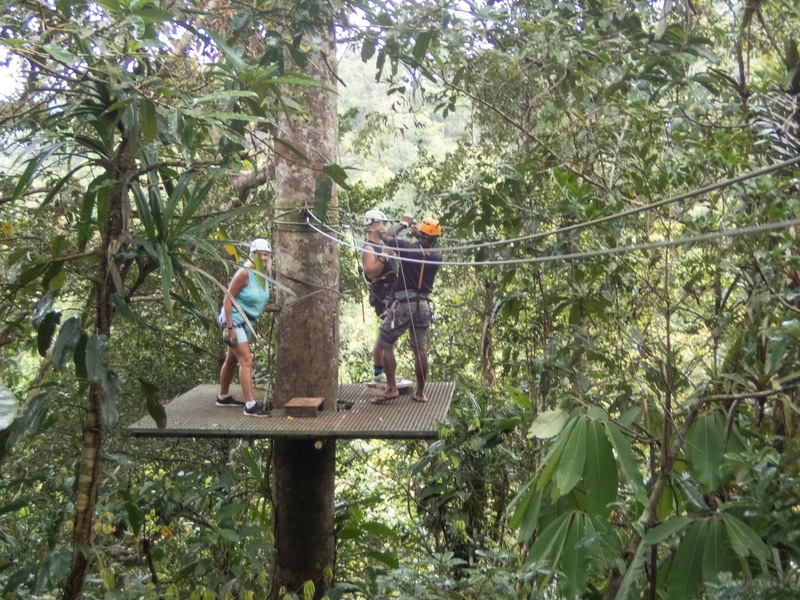 Our friends Annemie and Elisabeth met us on Thursday and we spent anexhilarating couple of hours zip-wiring in the forest near Suva, before driving in our luxurious Land Rover Discovery inland to the Highlands. The scenery was stunning: steep mountains above meadows with grazing cows (Dutch Annemie was convinced they were Friesians) and meandering streams. Lunch was hunks of just-imported Gouda as there were no restaurants; even habitations were few and far between. We stopped at one and were given a tour of the village, Fijians as usual smiling and welcoming. end of their day. We asked some where they lived and they told us it was an hour's walk away, so we loaded 7 children in the back amongst the luggage and became the noisy, giggly school bus for a while. 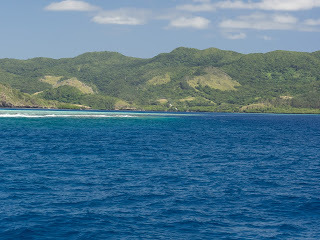 Later, having turned back towards Suva, we stopped for a young man hitch-hiking. As soon as we offered him a lift, six of his friends came rushing over. They were a Rugby Sevens team, going to compete in Suva, and the daily bus hadn't arrived that morning. 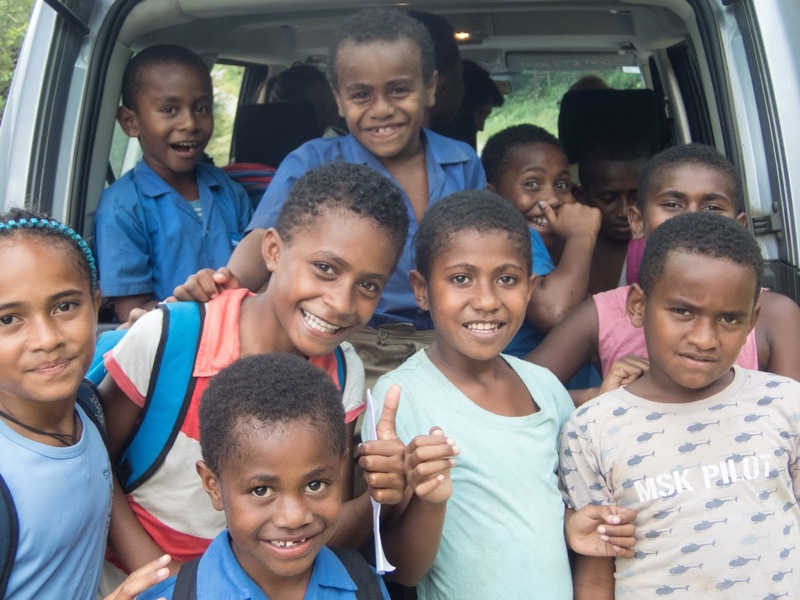 These were strapping young men and we couldn't fit them all in, but managed to squeeze five into the 'bus' and dropped them off an hour later with promises to follow their progress in the rugby tournament. Not every day is full of action and neither is every day time to move on. Sometimes it's good just to hang out, read and relax. We do, sometimes, really! 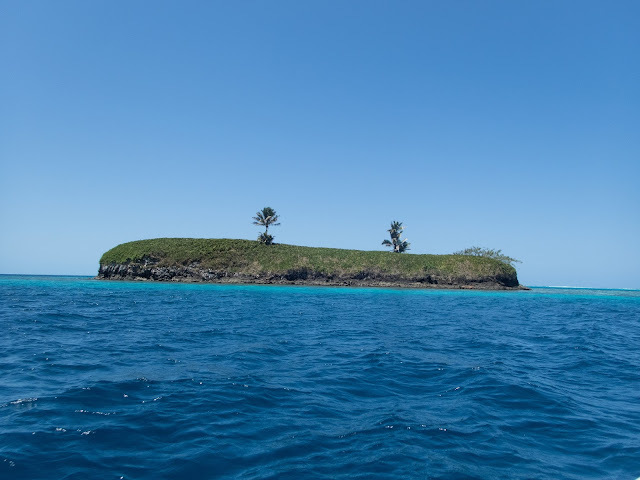 We can't possibly see all of Fiji's islands this time and we have consciously decided not to rush the southern group of Kadavu in order to visit the more touristy diving resorts in the Yasawa and Mamanuca Islands. had we enjoyed the cassava he had given us and shown us how to prepare? Did we need any papaya? Please could he have a solar light, too? where we dispensed many more glasses. 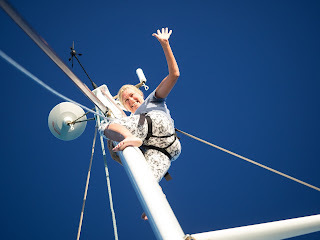 While the sun was still high, we went through a pass in the reef and out into the sea, then back in through a narrower pass with thundering surf on either side, Elisabeth at the helm with Charles beside her, Annemie and I on watch at the bow. Supper on board, a quiet anchorage, a good night's sleep and this morning's sunrise was spectacular, with small birds skimming above the water around the boat, the odd splash of a jumping fish but otherwise perfect calm apart from the now-distant surf on the reef. We're hoping to find some good snorkelling (maybe diving) today. It's still September in England but we are enjoying a good start to October here!